Which test is the right test? In clinical practice, determining an appropriate genetic testing strategy in the evaluation of a patient with unexplained epilepsy is often inconsistent and left to the treating provider, given the lack of evidence-based guidelines. Oftentimes external factors, such as insurance hurdles, dictate the genetic testing that can be ordered. A recent meta-analysis in Neurology attempts to answer the question about which genetic test is most cost-effective in patients with epilepsy, which may aid in the decision making when considering a genetic evaluation of a person with epilepsy. Figure 1. 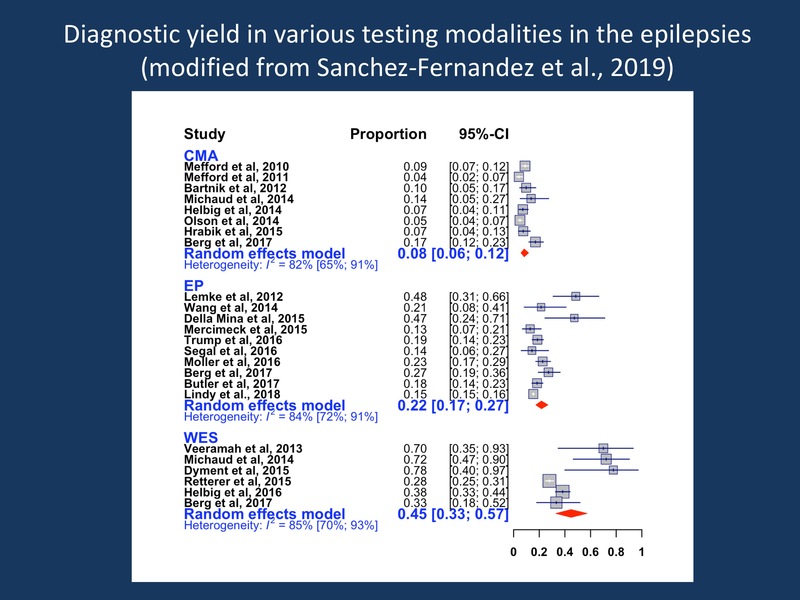 Diagnostic yield in various testing modalities in the epilepsies. The current figure is modified from the code provided by Sanchez-Fernandez and collaborators as part of the publication on github.com/IvanSanchezFernandez/CostEffectivenessGeneticTests. As a modification of the data used in their publication, the publication by Lindy and collaborators was added, which slightly decreased the diagnostic yield in gene panel testing as their study only had a 15% diagnostic yield. CMA = chromosomal microarray, EP=epilepsy panel, WES = whole exome sequencing. The WES data are not adjusted for publication bias. Comparison of three testing strategies. Sanchez-Fernandez and colleagues compared three testing strategies in terms of diagnostic yield and incremental cost-effectiveness ratio (ICER). ICER is a measure in healthcare economics that calculates the extra cost per extra unit of health effect – in the case of genetic epilepsies the cost of diagnosis, which is determined by both the cost of the test and the diagnostic yield. In their study, the authors compared chromosomal microarray, epilepsy panel with deletion/duplication analysis, and whole exome sequencing. A meta-analysis of 20 studies revealed that whole exome sequencing (WES) reported the highest diagnostic yield of 32% (95% CI 22-44%), after adjustment for publication bias. The yield of epilepsy panel was 23% (95% CI 18-29%), and chromosomal microarray had the lowest yield of 8% (95% CI 6-12%). These findings are consistent with an epidemiological study in children with early-life epilepsies, which found that NGS-based testing methodologies had higher yields than microarray. The most cost-effective testing strategy. Although whole exome sequencing had the highest yield, it was not the most cost-effective option, due to the relatively high cost of the test. The most cost-effective option was epilepsy panel which had an incremental cost-effectiveness ratio (ICER) of $15,848 per diagnosis, given the fact that this is a less expensive test. The ICER of WES was $34,500 per diagnosis. The low diagnostic yield of chromosomal microarray means it only becomes a cost-effective option if it were to cost $1,267 or less. Taking this information into account, the most cost-effective testing strategy in a generic patient with epilepsy is to begin with an epilepsy panel, move onto a microarray, and finally whole exome sequencing if everything else is unrevealing. This defies the clinical intuition that exome sequencing may be the “best test” to start with, but it should be noted that this is a consideration from a healthcare economics aspect, not a consideration based on clinical decision making. Practical considerations and limitations. Although in general an epilepsy panel is the most cost-effective option in terms of cost of test per diagnosis, practical considerations come into play. For example, in some scenarios a faster turnaround time may be more important than cost when weighing testing options, for example a critically ill neonate in whom a rapid exome may be indicated. Also, their study assumes that the tested population in all studies included in their analysis looked at the same patient population, which may not necessarily the case. Furthermore, the analysis by Sanchez-Fernandez and collaborators assumes independent probabilities, meaning that the analysis assumes that the diagnostic yield of each test is independent of the diagnostic tests that have been done before, which we know in a clinical context is not true. No studies have evaluated the diagnostic yield of genetic tests conditional upon the yield of prior tests. Therefore, the diagnostic yield and therefore the cost-effectiveness of whole exome sequencing as a first-tier test, for example, may be underestimated since most patients who undergo WES have had prior negative testing. What you need to know. The conventional step-wise testing strategy of chromosomal microarray → epilepsy panel → whole exome sequencing is not supported by a meta-analysis investigating the cost-effectiveness of these three tests in people with epilepsy. These data suggest that chromosomal microarray is the least cost-effective option in people with epilepsy. Put differently, both with respect to diagnostic yield and cost effectiveness, chromosomal microarrays are the big loser of the meta-analysis by Sanchez-Fernandez and collaborators. The most cost-effective testing strategy for people with epilepsy is epilepsy panel → chromosomal microarray → whole exome sequencing. However, this applies to the group of patients to be tested as a whole and should not deter from an individual assessment for each patient based on phenotype. This entry was posted in 2019, Genetic analysis and tagged cost-effectiveness, exome, gene panel, Genetic testing, microarray. Bookmark the permalink.